By round two, kids were playing horseshoes, badminton and bolo between rounds, catching salamanders and craw dads, eating hot dogs cooked on a camp stove and enjoying the rays of sunshine. But then the intermittent rain storms hit. Towels were passed around and skillful games continued, despite a leak in the shelter roof. The waterproof chess boards had no problem but Josiah had to stand back from his game to avoid the cascade of water that spilled at his seat. He still won his game despite the distraction. 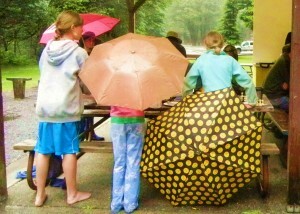 During a later game when another rain shower hit, Sam sat at the wet seat protected by her umbrella. Aaron Grabinsky continued to demonstrate his skill as he was once again, undefeated. Winning four out of five games were Josiah Perkins whose only defeat was against Aaron, Joshua Grabinsky the younger brother of Aaron who also succumbed to his older brother, and Angelina Perkins, mother to Josiah Perkins, who suffered a loss to her son during the fourth round. 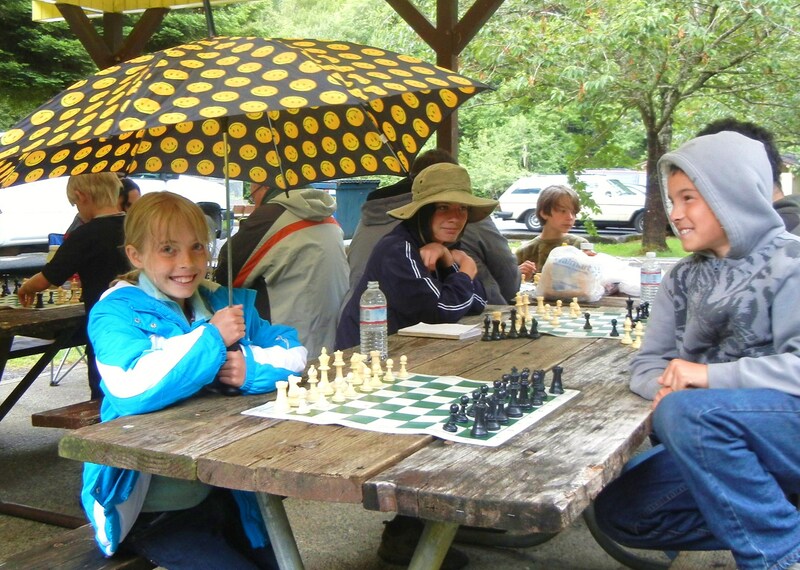 There are two more LaVerne Park Chess Tournaments: July 7th and July 28th; the weather is expected to be nicer. Registration is 10:00 a.m. with a small fee of $5.00, Park fee is $2.00 per car. Hot dogs, bottled water and chips provided. Feel free to bring food for potluck picnic. Prizes are squirt guns and outdoor toys. Tournament is rated. Adults and kids invited! Signs of which shelter the tournament is located will be posted at the main gate booth. Call Nancy Keller 541 290-8479 for questions, directions and preregistration!